The selection of Beijing and The People's Republic of China to host the 2008 Olympics was always a controversial choice, which has thrown a sometimes unwelcome spotlight on the country. China's record on Internet censorship, human rights, the death penalty and the environment have all been questioned by the Western media as they cover the build-up to the games, and the torch relay, intended to be a celebration of the spirit of the games, was instead a focal point for protests over Tibet. It may be a maxim that sport and politics should never mix, but in truth the modern-day Olympics have nearly always been inter-twined with the politics of the day. As this year's Olympic Games arrive, I'm going to examine the history of political dissent at the Olympic Games, and look at some of the resources on the Internet covering these events. Whilst 'official' Greek history has an Orwellian feel about it which dictates that Airstrip One has always been at war with Eurasia Greece has always been at war with the Ottoman Empire, there were obviously some thaws between the founding of the Hellenic state in 1832, and the final Treaty Of Lausanne in 1923. 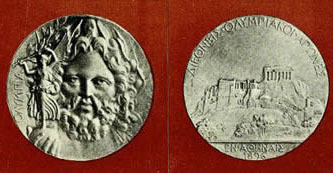 The 1859 Evangelis Zappas games were one such moment, and despite simmering disputes over who owned various islands, they featured athletes from the new nation state of Greece and the Ottoman Empire, which until 27 years earlier had occupied Athens. Further editions of the games were held in Athens in 1870 and 1875, but it wasn't until 1896 that the modern recognisable Olympic Games were held. This was due chiefly to the work of Frenchman Baron Pierre de Coubertin, and his motivation was also to an extent political. 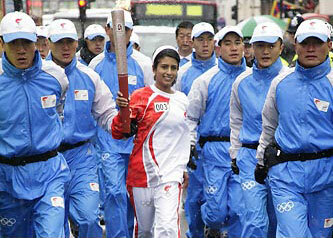 He had conceived the idea of youth competing in sport at a national level as an alternative to war. 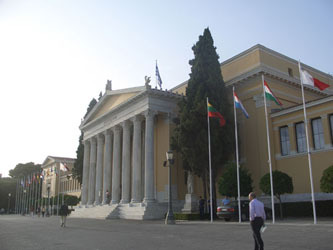 The 1896 games were held in the same refurbished Panathinaiko stadium that had held the 1870s Athens-based contests, with the addition of an indoor venue - the Zappeion. Named after Evangelis Zappas, who again provided the funding and whose head is buried underneath a statue in front of it, the building was used for the fencing competition in 1896, making it the first purpose-built Olympic venue. 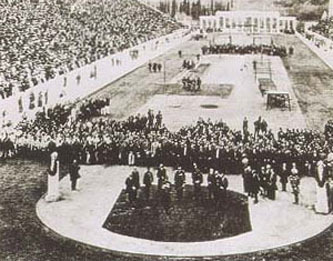 Athens in 1896 started a fine Olympic tradition of the games being used to promote the national aims and ideals of the host. It can be no coincidence that the opening ceremony of the games took place on the anniversary of the declaration of the Greek War of Independence. Unlike the 1859 Zappas Games, or the 1906 Athens Intercalated Games, there were no representatives from the Ottoman Empire in 1896. Athletes from Smyrna (modern Turkish Izmir), Cyprus (then under British rule) and Egypt were all listed as being 'Greek' on ethnic rather than geo-political lines. King George I of Greece was the master of ceremonies, having been parachuted into ruling Greece by the 'Great Powers' in 1863. Even with his Dutch origins as Prince Villheim, he declared publicly that he thought the games should always be held in Athens, and the American athletes at the competition sent a petition to the fledgling IOC agreeing with him. Mind you, the games nearly didn't take place at all. 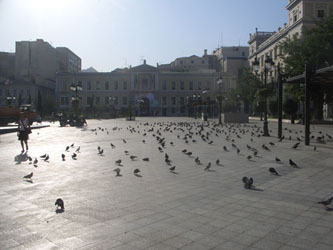 In a tale that will sound familiar to anyone who has been following the way London has been preparing for 2012, in 1894 the entire Greek organising committee tendered their resignation, because their plans for hosting the games had gone three times over budget. There was no place for women at the 1896 Olympic Games, which led to what can perhaps be described as the first public act of Olympic protest and dissent. In the day following the marathon race, a Greek woman, Stamata Revithi, ran the same course to demonstrate that it could be done by a woman. She was prevented from crossing the official finishing line inside the stadium, but is supposed to have recorded a time of around 5-and-a-half hours. Women had to wait another four years for their first shot at an Olympic title. In the next part of this series I'll be looking at Olympic dissent between the turn of the 20th century and the outbreak of the First World War, covering Olympic Games held in Paris, St. Louis, Athens, London and Stockholm. By Martin Belam on 1 August 2008. No arguably about it. The first modern international Olympic Games was held in Athens in 1859. It was international because participants from more than one nation competed (Greece and the Ottoman Empire but more than that since Smyrna (Izmir) remains occupied by Turkey today). Evangelis Zappas bought the ancient Panathenian stadium and paid for its refurbishment. That stadium was used for Olympic Games events in 1870, 1875, 1896, 1906, and 2004. Without it the 1896 Athens Olympic Games that fell under the auspices of the International Olympic Committee would probably not have happened. Evangelis Zappas is an early founder of the modern Olympic Games. So too is Dr William Penny Brookes who organised a national Olympic Games that was held in Crystal Palace in London in 1906. Baron Pierre de Coubertin visited Dr Brookes in the UK and the rest is history. The Baron adopted many of Dr Brookes' ideas and founded the International Olympic Committee (IOC). Ofcourse, the IOC does not officially recognise the earlier Olympic Games, because they did not organise them, but that does not make the 1859, 1866, 1870, or 1875 Olympic Games any less Olympic. I think that you are complicating "nationality" and "ethnicity" more than is necessary. Pete Sampras is a world-renowned Greek-American tennis player. Whenever he competes, he competes for the United States. If he were alive during the 1859, 1870, 1875 and 1896 Olympic Games and competed in them. Are you saying that the fact that he was born in the United States doesn't count and that the Games would not be international if Sampras had attended? Mark Philippoussis is a famous Greek-Australian tennis player. He competes for Australia. How would you categorize him? These early games were international because the participants were foreign nationals. Their ethnicity doesn't come in to it. At the Athens 1875 Games one of the competitors, Mark Joseph Mindler, whose parents were both Bavarian, was actually born in Greece. Are we classifying by ethnicity or place of birth? If we are going to argue for ethnicity then a German competed at the Athens 1875 Olympic Games. What would you do if you were hosting a national competition for citizens of a specific country? Can any non-national compete? One of the prizes awarded during the Athens 1859 Olympic Games was sponsored (paid for) by an Englishman (Dr William Penny Brookes). Is that a national or international prize? It doesn't need to be this complicated. well,with regard to the Olympics that was just held in China, it seems as though the world had to really use their political diplomacy skills. Starting off with minor things like the overinflated fireworks show that was purely computer-generated, to the lip synced Chinese girl who looked better than the original singer, to the controversy over age... It seems like we fought to practice restraint with our host. And now we find out, that prior knowledge of tainted milk may have existed while the Olympics was going on. What gives? As far as faking the fireworks and the opening performance goes, its really not such a big deal. Happens from time to time in the entertainment industry to produce a better performance. Hosting an international sporting event, its perfectly normal to attempt to create a memorable experience and showcase the country to the world.